Prophet is one of the class options for the archetype Healer. It was introduced in The Trollfens expansion. The Prophet class has several skills that interact with the Insight Token. 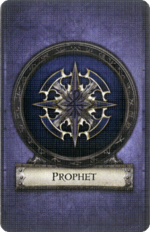 This token does not have an inherent function, and is used specifically with the Prophet class. When a player chooses the Prophet class during Hero Setup, they place the insight token in their play area. There is only one insight token. During a game, it is either in the Prophet player’s play area or on a player’s Hero sheet. Each time a player is instructed to gain the insight token, they takes the insight token from its current location and places it on their Hero sheet. Only one player can have the insight token on his Hero sheet at a time. Each time the insight token is discarded (normally to trigger an effect from one of the Prophet’s skills), it is removed from its current location on the Hero sheet and placed in the Prophet player’s play area. Starting equipment for a Prophet is an Iron Flail , the trinket Sage's Tome, and the skill Soothing Insight. Soothing Insight 0 Exhaust this card during your turn. You or 1 hero of your choice gains the insight token. Battle Vision 1 You gain +1 up to a maximum of 6. Grim Fate 1 A hero with the insight token may suffer 2 and exhaust this card during his turn to force the overlord to reveal the top card of the Overlord deck. Victory Foretold 2 Exhaust this card when a hero with the insight token attacks a monster, before rolling dice. Discard the insight token for that hero to roll an additional green power die on the attack. Focused Insights 3 You gain +2 Health. Prophet starting skill Soothing Insight. Prophet starting weapon Iron Flail. Prophet starting trinket Sage's Tome.